Je hoeft geen aanhanger te zijn van het Israelische regeringsbeleid om tegen boycots van Israel en Israelische evenementen te zijn. Yet despite his opposition to Israeli policies in the West Bank and Gaza, Seeger refuses to heed calls to boycott an upcoming peace event organized by an Israeli institution. In recent weeks, Seeger has rejected calls by individuals and organizations demanding that he cancel his participation in "With Earth and Each Other: A Virtual Rally for a Better Middle East," an online event promoting peace through cross-border cooperation and scheduled for a Nov. 14 global broadcast at www.withearthandeachother.org. De boycotbeweging is niet voor vrede, integendeel. Men is tegen vredesbijeenkomsten en toenadering van Israeli's en Palestijnen. De BDS beweging heeft al vaker geprobeerd dialoog- en verzoeningsactiviteiten te dwarsbomen. SAN FRANCISCO (JTA) -- No one tells Pete Seeger what to do. At 91, the iconic folk singer has penned hundreds of protest songs, railing against everything from the Vietnam War to global warming. He was blacklisted in the 1950s, he slept under the stars with striking farmers and he still reads the Communist "People's World" -- along with The New York Times, of course. 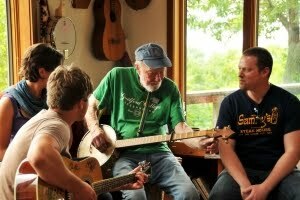 "My religion is that the world will not survive without dialogue," Seeger told JTA in an interview from his home in Beacon, N.Y. "I would say to the Israelis and the Palestinians, if you think it's terrible now, just think ahead 50 years to when the world blows itself up. It will get worse unless you learn how to turn the world around peacefully." Seeger was invited to perform for the online peace rally by event organizers Friends of the Arava Institute, the North American fund-raising arm of the Arava Institute for Environmental Studies. The institute works with Arab and Jewish leaders to solve the region's environmental challenges cooperatively. Thirty other organizations have signed on to the event, ranging from Peace Child Israel to the Jewish National Fund. Actor Mandy Patinkin will emcee an event that will feature group viewings organized around the world from San Francisco to Bonn, Germany. Activists from the boycott, divestment and sanctions movement have been pushing Seeger to cancel, posting open letters to him on their websites. Seeger says he's going forward and already has recorded two songs: "Od Yavo Shalom" (Hebrew for "Peace Will Yet Come") and a Lebanese song in Arabic performed with alumni of the Arava Institute. And he may break into song spontaneously during the live broadcast, too. That doesn't mean that he supports Israeli policies toward the Palestinians, Seeger says; quite the contrary. He is a longtime donor to the Israeli Committee Against House Demolitions, an organization that became so critical of Israel that it was dropped by the New Israel Fund years ago, and readily decries what he calls "monstrous" Israeli military actions against Palestinian civilians. Seeger made his first trip to Israel in 1964 with his wife and children, and spent time on several kibbutzim, where he recalls being "impressed by the energy." He visited again right before the June 1967 Six-Day War, performing the hit song "Tzena, Tzena, Tzena" before a crowd of tens of thousands in Tel Aviv. "Tzena," which he recorded in 1950 with The Weavers, remains the only Hebrew-language song to make it to the top of the U.S. music charts. Right before that trip, Seeger stopped off in Lebanon. "I was told not to mention I was going to Israel the next week or I might not make it," he said. "I hadn't realized how serious the situation was." Things "have gone from bad to worse" in the Middle East, says Seeger, who notes that he rarely travels anymore except for occasional trips to New York City. Holding up the example of the Montgomery bus boycott as the key to ending racial segregation in the American South, Seeger says he does not oppose nonviolent efforts, including an economic boycott, to end the Israeli occupation of the West Bank and Gaza. But standing in the way of promoting dialogue makes no sense, he said. "I understand why someone would want to boycott a place financially, but I don't understand why you would boycott dialogue," Seeger said. "The world will not be here in 50 years unless we learn how to communicate with each other nonviolently." The online peace rally, which begins at 1p.m. EST on Nov. 14, presents itself as nonpolitical. "The purpose is not to take a side or suggest what a peace process should look like, but to raise the voices of those on all sides who yearn for peace and show that there is another side of the conflict in which people are striving to work together for the betterment of all," rally co-chair Mohammed Atwa said in a news release. "It will be a long struggle, taking generations," Seeger said of Israeli-Arab peace. "But if we don't try, we abandon the world to those who believe in violence."